I have calcium deposits on my bones. Will there be any risks involved in my vein ligation and stripping surgery because of this? Would laser treatment be a good option? I had about 20 small veins stripped a yr after my 2nd pregnancy which alleviated aching in the back of my thigh. Then a year later my strafanous vein was stripped from the back of my knee to my ankle. Which alleviated pain in the back of my calf. I still have swelling and pain in my ankle with what looks like a bulging vein running under my ankle bone. I have to wear a compression sleeve constantly. I have the visible look of the swollen ankle but worse is the pain. My mom is 84 years old and had her veins stripped about 45 to 50 years ago. Her legs are constantly cold. Is this a result of the vein striping? My doctor told me that the best treatment for me is surgical removal of veins.Is this right? I'm in my 30's and developed varicose veins on both legs after giving birth. They were getting worse in short time and more veins appeared. My doctor told me that the best treatment for me is ligation and stripping. I'm wondering if I should consult a different specialist or just stick with him. I can't really afford changing doctors but I don't want to go through a difficult recovery if there is a less invasive option. Hi there, I had the GSV on my left leg surgically removed from groin to ankle 10 days ago. Why do I have many new lumpy veins? Why do I have to have so many procedures? I have gone for two treatments, and going tomorrow for another. Then five more on the same leg. I went for a vein stripping surgery but the doctor decided to just do a vein ligation at groin instead. He said this would work too. is that true? I had a duplex scan and confirmed that 2 valves, at the groin and behind my knee were nonfunctional. 2 weeks ago, i went for the vein stripping surgery but he decided to just do vein ligation at the groin. After surgery, he told my husband that i was too small to do (I am 5 feet, 100lb), (also he had another patient waiting to have vein stripping after me). During the follow up appointment, he said ligation was sufficient. Is that true? How is that possible? my leg feels so tired since then. I had a vein removed in my upper leg for bypass surgery, and now I have a burning sensation in my leg. Is this normal? What is going on? How long should I wear compression stockings after vein stripping for CABG? Is it common for clots to develop and for the area behind my leg to swell and feel tight/sore after vein stripping surgery? After undergoing vein stripping surgery, I developed blood clots. Now, I have to give myself injections in the stomach for two weeks, according to my doc. Is it normal for blood clots to develop and for the area behind my leg to swell and feel tight/sore after the procedure? Is it normal for more clots to develop? Will the injections help with the blood clots? How long will it take for the clots to go away? I'm 3 months post-vein ligation and 2 months post-sclerotherapy. I still have the same intense pain I had prior to surgery. What is wrong? On 2-11-16, I had vein ligation of the GSV. Then, on 3-21-16, I had sclerotherapy on my left leg. Pain in my left leg is the same & more frequent than before surgery. Elevating my leg and resting it on any elevated prop eases the pain. When my foot is put back down flat & the walking or standing continues, pain comes back. I wear shoes that are custom-made for my feet with arch support, so it isn't the shoes. The other night I was awakened by the pain in left leg. What's wrong? Will the pain I'm experiencing post-vein stripping ever improve? I had both legs stripped, with additional cuts two and a half weeks ago. I'm still experiencing shooting pain near my right shin when standing still and, to a lesser extent, when sitting down. Pain also occurs when when I stand after lying down for a while. The pain is quite severe, continuous and maddening. The only thing that relieves the pain is walking. Will it ever go away? Are there any things I can do, besides walking, to relieve the discomfort? Is it normal for the pain to increase after having a varicose vein removed? I had a varicose vein removed six days ago. I'm experiencing more pain now than I did right after the procedure. Is this normal? I'm also experiencing a burning sensation where the incisions are. I have a painful lump inside my leg where the vein was removed. What should I do? 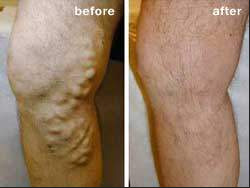 I had my varicose veins removed about 10 years ago. I started cycling and discovered a painful lump in the inside of my leg where the vein was removed. What should I do? Are there potential new varicose veins following stripping and phlebectomy? Can they be treated before they turn into unattractive/bulgy looking ones? I had GSV vein stripped six months ago and additional phlebectomy done two months ago. But, I can already see some blue veins on the same leg and near where the varicose vein was. They are not bulgy or ropey and my skin is smooth, but I can see them clearly under the skin surface. Are these potential new varicose veins? Can they be treated before they turn into unattractive/bulgy looking ones? How is it possible when I am quite fit, walk a lot and have very little fat on my legs. After stripping surgery, a vein or something soft to touch is still visible and lumpy. Might it be another vein that the doctor forgot to strip? I had a vein that ran from the middle of my left thigh and under my knee stripped. Six weeks after the second surgery, at the front of my calf, where the bulgy vein was visible, I can see some small lumps, soft to touch (less bulgy and hard than varicose vein was), but it’s there and looks sort of dark blue under the skin. I have no bruising elsewhere and no pain or discomfort. Might it be another vein or a vein that the doctor forgot to strip? Is it too early to tell? I have a clot 1cm from the Sapheno-formal junction. I will be operated in a few days. In the meantime should I rest or can I move around? The clot has spread since the initial diagnosis and swelling a week ago. I have a varicose vein in my left thigh, swelling in the left groin and varicose veins and a dull pain in my scrotum. What are my options? My doctor says it isn't dangerous and that surgery is at discretion. I don't plan to have more kids, but I don't want my sexual health compromised either! I want to avoid general anesthesia and prolonged recoveries. If I need to get this fixed, what are my options? I have a lunp underneath my skin, what do I do now? Is this normal? Could it be that they missed a vein? I had veins in both legs stripped 9 days ago. After checking my legs recently, I noticed a lump underneath my skin. What do I do now? Is this normal? Could it be that they missed a vein? I have a varicose vein wrapping around the nerve in the tarsal tunnel. Is vein stripping an option or is TT decompression surgery needed? MRI and ultrasound show no other varicosities. Compression stockings were not helpful. Pain/numbness going on six years.